Unless we go to a zoo, very few of us are going to see a kangaroo in daily life. This is too bad, because kangaroos truly are one of the most charming animals on the planet. But if we can't see one every day, at least we can learn how to draw one. The biggest part of a kangaroo is its huge, powerful hind legs. The next most important thing to pay attention to as an artist is how the back makes an almost perfect half circle slope from just below the top shoulders, arching down over those big hind legs, and then sweeping into the tail. 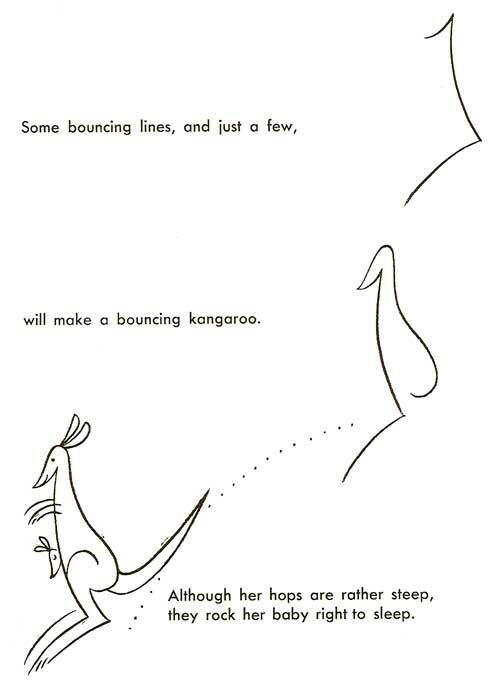 This is an important line to get right in your kangaroo drawings. Also be sure to get the size of the tail right. Kangaroos have huge thick tails (as thick as the lower part of their hind legs) to help them balance. The tail typically ends in a black section of fur about a foot long. The front legs of a kangaroo are about a quarter of the size as the hind legs. Their heads have a definite triangle shape to them, leading down to a small, sweet looking nose and mouth. Their ears are very large... maybe two-thirds the length you would make rabbit ears. The female's pouch opening is just below the center where her hips are from a standing up, front view.